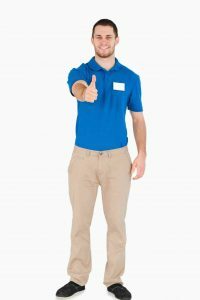 Use Your Uniforms to Market Your Company | Ace Uniform Services, Inc. There are many reasons why companies have their employees wear uniforms. There are many reasons why companies have their employees wear uniforms. It enhances the team atmosphere, makes everyone recognizable to customers, and even keeps professionals safe while they’re on the job. From a business perspective, you can also use your company uniforms to market your business. Here are the ways you can use your uniforms to grow your business and market your company. It’s especially important for new businesses to establish a brand identity. This will allow them to stand out amongst the crows of competitors. The brand is what makes your business unique and will ultimately become the selling point that helps people choose your product or service over the rest. When it comes to uniforms, you can use them as a platform for establishing your brand. Create a memorable look, color scheme, and logo that people will always associate with your business. Your employee uniforms are the perfect place to display your company logo. Whether it’s an image, a word, or a combination, your logo plays a major role in what makes your brand identifiable. A logo on a bag lets people know where you like to shop and the logo on your company uniforms lets your customers know exactly where they work and who they can turn to for assistance and answers to their questions. The styling of your employee uniforms reflects your company culture. If the styling is casual, then it shows that the atmosphere and culture of your business are more relaxed than in other places. If it’s closer to being business formal, then your customers and clients can likely expect an atmosphere that is much stricter and more refined. Therefore, consider the pieces that you incorporate in your uniforms, including t-shirts, polos, slacks, ties, sports coats, or button-up shirts. Market your company’s professionalism through your company uniforms. Investing in uniforms shows that you care about the opinion and experience of your customers. It also ensures that your employees will always project a professional and tidy appearance when they’re at work. This entry was posted on Friday, January 18th, 2019	at 1:48 pm	. You can follow any responses to this entry through the RSS 2.0	feed. Both comments and pings are currently closed.